Herbert Francis Ludwig, 101, of Waterloo, Iowa, died Friday, February 8, 2019. He was born January 10, 1918, in Oyens, Iowa, to Mike and Mary (Mae Kestel) Ludwig. He was the third of six children. He married Agnes Ryan of Le Mars, Iowa, on April 29, 1943. 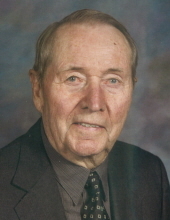 Herbert attended grade school at St. Catherine’s in Oyens, graduated from high school at St. Mary’s in Remsen, Iowa in 1935 and Western College in Le Mars, Iowa in 1941. Following college he moved to Waterloo and worked at Rath’s. He joined the Navy in January, 1943 and attended the Training Center in Chicago where he took navigation courses and graduated as an Esign in the U.S. Navy. He spent 3 years in the Pacific during WWII mostly on the Destroyer U.S.S. Grayson and was discharged from the Navy as a Lieutenant in December, 1945. Following his discharge he returned to Rath’s until the spring of 1945 when he started farming south of Waterloo on Hess Road. He and Agnes retired from farming and moved to Friendship Village in May, 2001. Herbert was also the Chairman of the Board for the new church at St. Mary’s of Mt. Carmel in Eagle Center 1974-1976 and in 1963 was a leadership member from Eagle Center for the addition to Don Bosco High School. Herbert is survived by four daughters, Anne (Leslie) Ludwig of San Francisco, California, Leah (Robert) Ladley of Eustis, Florida, Lois (Robert) Snyder of Green Bay, Wisconsin and Jane (Mark) Martin of Sioux Falls, South Dakota; a daughter-in-law, Linda Ludwig of Waterloo; nine grandchildren and seven great-grandchildren. Services: 11:00 a.m. Monday, February 11, at St. Edward Catholic Church with burial in St. Mary of Mt. Carmel Cemetery, Eagle Center. Full military rites will be conducted by Gilbertville American Legion Nugent Demuth Post 714, assisted by the Naval Honor Guard. Public visitation will be 3-7 p.m. Sunday at Hagarty-Waychoff-Grarup Funeral Service on South Street, where there will be a 3 p.m. rosary and 6 p.m. vigil service. Visitation also one hour prior to services Monday at the church. In lieu of flowers, donations are suggested to St. Edward Catholic Church or the Pavilion at Friendship Village on Park Lane in Waterloo. To send flowers or a remembrance gift to the family of Herbert Francis Ludwig, please visit our Tribute Store. There will be a 3 p.m. Rosary and 6 P..M. Vigil Service. Visitation also one hour prior to services Monday at the church. "Email Address" would like to share the life celebration of Herbert Francis Ludwig. Click on the "link" to go to share a favorite memory or leave a condolence message for the family.